The baby bongo looks for a place to lay down after feeding with her mother. Honolulu – Just in time for spring, the Department of Enterprise Services is happy to announce that a baby bongo antelope was born at the Honolulu Zoo on the afternoon of Tuesday, Feb. 19. The female calf, weighing approximately 30 pounds, is the first offspring of Topanga (mother) and Cory (father), both five years old. The one-month old baby bongo and her mother, Topanga, are currently on exhibit. Zoo staff are in the process of determining a name for the calf. Bongos are herbivores and mostly nocturnal. Females have horns, but the males’ horns can grow up to three feet in length. Noted for their bright, glossy, chestnut brown color, they have 12 to 14 vertical white stripes, which help conceal them in their natural forested habitats. Listed as “near threatened” by the International Union for Conservation of Nature (IUCN), there are approximately 28,000 bongo antelopes in the world. 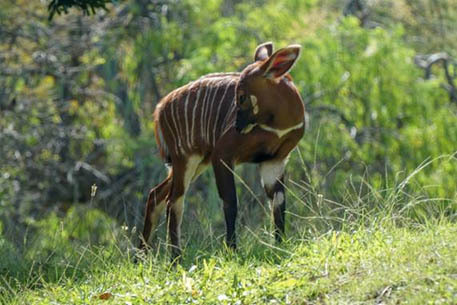 Found in eastern, western and Central Africa, bongos are the most spectacular and the largest of the forest antelopes. To download photos and b-roll of the baby calf and its parents, please click this link (no courtesy required): https://drive.google.com/file/d/1yMawvFtYNzNaqiHfLRjVxVGtLthk4ggI/view.